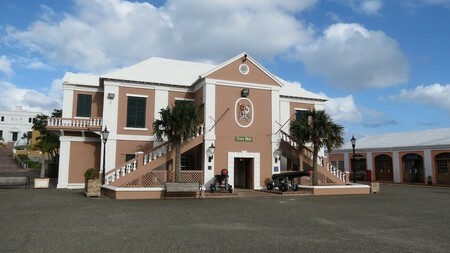 Town Hall is located at the eastern side of King's Square in St. Georges Bermuda. The building was originally constructed in 1782 during the British colonial days. Today, the Mayor of the town and the council meets here regularly to take decisions related to the town's administrative matters. Bermuda cedars have been used extensively for the interiors which is aesthetically designed and has lovely cedar ceiling and floor. 1) In 1998, a flagstone was brought in from Sir George Somers's home town in England and has been laid at the entry way of the Town Hall. Somers was the founder of Bermuda whose ship Sea Venture strayed in a storm and wrecked near the shore of St. George. 2) Portraits of earlier Mayors of the St. Georges town. For over 100 years, mayors have been holding the civic government meetings at the town hall. 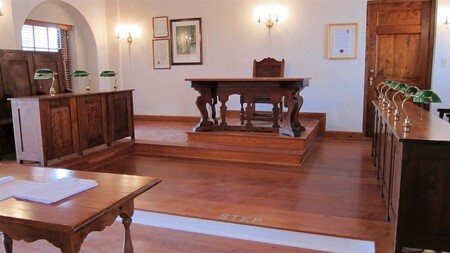 3) Bermuda cedar furnishing, chairs and tables along with Mayor's Throne. If you want, you can sit on one of them and get your own photograph taken. 4) An 1861 painting of St. George Harbor created by the Edwin James, a renowned British artist who was a resident of the town. Admission is free. There are toilets just behind the Town Hall. Open to public 10a.m - 4p.m, Monday-Saturday (when not in session). Check out Bermuda Tourist Map to see the location of Town Hall in Bermuda.